I have finished doing all the updates that I wish to do, and there are no new sources of strips to mine, nor is there much point in doing any more cleanups of scans. From time to time original artwork is sold via the web and I am able to obtain scans of the highest quality but the pace of this is slow and unpredictable. The Bristow website will remain as it is for the forseeable future. Not much to add so far this year. I am still cleaning up old scans but there is not a lot left to do. There are very few pages on the site that need to be updated in any case. I'll put a note here when there is something worth writing. Work has been continuing for a long while, as I gathered strips from the online newspaper archives so generously provided by Google. I have also made full use of the archives of the Sydney Morning Herald, which have a full run of the paper up to February 1995 (Google's archive has many missing issues and stops in 1989). 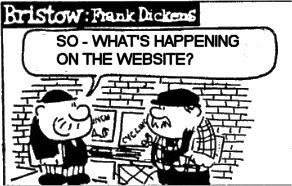 I now have virtually all the strips published from 1961 through to 1994, a fair selection from 1997 to 2001 and almost everything published on frankdickens.com since. The main gaps are some of the earliest from the Aberdeen Press, a few patches in the later 1980s, and the years 1995-1997. I am still seeking the best quality strips and cleaning digitally as far as I can. If any reader would like to help me out, please get in touch. Much of the image collection task is complete and many poor quality strips on this site have been replaced with better versions. I am now able to make a lot of updates to this website. This will continue so do please check out this section from time to time if you want to see what's new..
Great Tea Trolley Disaster of '67 (December 2012) - much more about this seminal event. I also discovered the Link Checker feature in Dreamweaver - I hope that all links now work correctly, including those that point to a section within a page. Still more edits based on research into strips published in the 1980s. New article on Robin Chester-Perry. New articles on Miss Rouge, Muscles Maddox (the firm's bully), Mr Meeke (the firm's scapegoat), the Sick Bay, Mr Tracer (the firm's amateur sleuth) and the Dreaded Hulines, as well as many extra pictures and textual revisions.